CGVyapam Counseling 2015 - Latest News: The latest news is that CGVyapam has declared counseling schedule for shortlisted candidates which is going to be conducted from 15th June 2015 to 19th July 2015 in three successive schedule. The document verification of ascending wise rank will be held for each 3000 candidates. The first counseling for document verification schedule will be conducted from 15th June 2015 to 29th June 2015. For second counseling the document verification will be held from 05th July 2015 to 09th July 2015 up to 05:30 PM to all category of the candidates. The last and final counseling document verification schedule will be held from 15th July 2015 to 19th July 2015 up to 05:30 PM. Those candidates who had qualified in written test, they can download CGVyapam PET Counseling Schedule, Counseling Procedure from direct link given here. 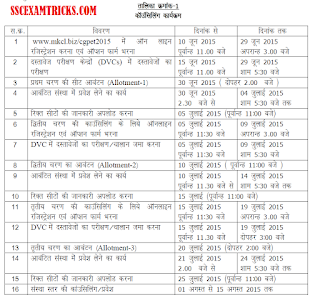 CGVyapam Result 2015 Declared - Check CGVyapam PPHT PET 2015 Scorecard Merit List - cgvyapam.choice.gov.in: CGVyapam has declared online result of PPHT and PET on 30th May 2015 on official website http://cgvyapam.choice.gov.in/. CGVyapam result 2015 for PPHT & PET has declared by Chhattisgarh Professional Examination Board (CGPEB). Candidates can download their CGVyapam result 2015 scorecard by enter their roll number displayed on the screen. Candidates are required to click on the direct link to download CGVyapam Result 2015 for PPHT and PET. The result link is given below. Earlier CGVyapam had successfully conducted Pre Engineering Test (PET) and Pre Pharmacy test (PPHT) for getting admission to various courses such as Diploma in Pharmacy and Engineering under CGPEB. CGVyapam had postponed the schedule of common entrance test (CET) from 30th April 2015 to a new date 01st May 2015 in two sessions. In the first session, CGVyapam had conducted Pre Engineering Test (PET) in the morning session from 09:00 AM to 12:15 PM. In the second session, CGVyapam had conducted Pre Pharmacy test (PPHT) in evening session from 02:00 PM to 05:15 PM. A huge numbers of candidates had appeared in CGVyapam Entrance Exam 2015. Here is that Latest News that CGVyapam has declared result of this written examination on official website www.cgvyapam.choice.gov.in. Those candidates who had appeared in CGVyapam Entrance Exam 2015 and waiting for result / Final Answer Keys, they can download their result / Final Answer Keys from the direct link provided below. CGVyapam had released official notification advertisement which invited online application from 10th March 2015 to 22nd March 2015 up to 11:59 PM on official website www.cgvyapam.choice.gov.in. Those candidates, who had completed 10+2 in Science stream from any recognized board, had applied for CGVyapam Entrance Exam 2015. The eligible candidates were called for written test which was held on 01st May 2015 from 09:00 AM to 12:15 PM for PET & 02:00 PM to 05:15 PM for PPHT. CGVyapam Entrance Exam 2015 for PPHT & PET was conducted on 01st May 2015 at various centres by Pen MODE. · There was no negative marking.